Pictured at a reception in the Croi Heart and Stroke Centre, Newcastle to mark the unique collaboration between Croi and NUI Galway, strengthening the National Institute for Prevention and Cardiovascular Health on its agenda to tackle the burden of heart disease and stroke, photo shows (left to right): Prof Bill McEvoy, professor of preventive cardiology NUIG; consultant cardiologist GUH and research and medical director NIPC; Professor David Wood, immediate past president of the World Heart Federation and adjunct professor of preventive cardiology at NUI Galway; Dr Jim Crowley, consultant cardiologist, GUH and research and medical director, Croi; and Neil Johnson, chief executive, Croi. Ireland is facing major challenges today in curbing the negative health impacts of obesity, diabetes, and an increasingly sedentary Western lifestyle, according to one of two world leaders in heart health who have taken up positions in Galway. Professor Bill McEvoy came from Johns Hopkins University School of Medicine in the USA and is now professor of preventive cardiology at NUI Galway as well as a consultant cardiologist at Galway University Hospital and the research and medical director of the local National Institute for Prevention and Cardiovascular Health (NIPC ). The institute, which was set up in 2014 as an affiliate of NUI Galway, is a strategic partnership between local heart and stroke charity Croi and NUI Galway and is leading the way in positioning Ireland as an international leader in cardiovascular health. Both Professor McEvoy and Professor David Wood recently joined NIPC and took up appointments at NUI Galway, supported by Croi. Professor Wood, the immediate past president of the World Heart Federation, moved here from the Imperial College London and is now adjunct professor of preventive cardiology at NUI Galway. At a reception in the Croi Heart and Stroke Centre, Newcastle, Galway, to highlight these developments, Prof McEvoy said Ireland had a long history of leadership and innovation in the prevention of heart disease and stroke. “However, like much of the developed world, we now face major challenges in curbing the negative health impacts of obesity, diabetes and an increasingly sedentary Western lifestyle. 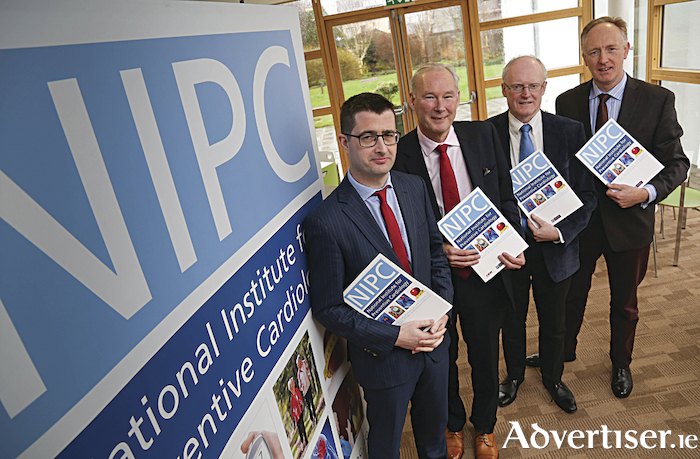 Cardiovascular disease remains the number one killer in Ireland and reducing the impact of this disease is what drives me and my colleagues at NIPC. He stated this suite was designed to train the next generation of clinical leaders in cardiovascular disease prevention - “leaders not just in Ireland but around the world”. Prof David Wood said he was “very proud” to be working with Professor Bill McEvoy in providing leadership in the prevention of cardiovascular disease. This will take place at three levels: “(i ) research into the causes, treatment and prevention of heart disease; (ii ) postgraduate teaching in preventive medicine through a new suite of postgraduate courses in cardiovascular health and disease prevention: ‘Preventive Cardiology’; ‘Diabetes and Cardiometabolic Disease’; ‘Obesity and Weight Management’ and ‘Lifestyle Medicine’; and (iii ) innovative service development through programmes such as those delivered by Croi in the community”.